Hi, guys! Hope you are having a lovely weekend! Today I’m pleased to introduce you to a really lovely book by a blogger that I’ve recently gotten to know and admire, Sanae Ishida. I took part in a super fun Secret Valentine’s Exchange hosted by Sanae and by Ute, a really sweet Instagram-based swap where I made a gift for Sanae and received one from Betsy. (I seriously lucked out… my gifts from Betsy were AMAZING). I did lots of snooping on Sanae’s feed to see what sort of gift she might like, and was really smitten with her clean, modern crafting aesthetic and her beautiful drawings. So when I was contacted by her publisher to take part in a blog tour for her book, I was pumped! Sewing Happiness: A Year of Simple Projects for Living Well (Amazon affiliate link here and Indiebound link here) is a book of sewing projects organized by season and mood- summer (health), fall (creativity), winter (relationships), and spring (letting go). I never would have thought of my life and seasons being organized around themes, but there’s something very resonant about this idea and I can definitely see these threads woven through my sewing output each season, for sure. The projects are simple and straightforward, with no PDFs to download or patterns to trace. They are geared towards beginners, but there’s a fun twist on the projects that make them enjoyable for people who have been sewing longer. They’re frequently inspired by Japanese design and and traditional crafts- origami and sashiko influences are particularly pretty. I am really attracted to this aesthetic and loved the sample projects and photos in the book. What I really love about the book, though, are Sanae’s essays about her journey from an unhealthy workaholic to a balanced, healthy woman. She writes beautifully about how sewing helped her regain confidence after losing her job, and how crafting, alongside exercise and diet changes, helped her feel much better both physically and emotionally. I often try to explain to others how much joy and health I receive from handmaking, but Sanae is much more eloquent on the topic than I am! So I think this would make a great and inspiring book for the people in our lives who are curious about why we devote so much time and attention to handcrafts. I think this could inspire them to join our cult community! 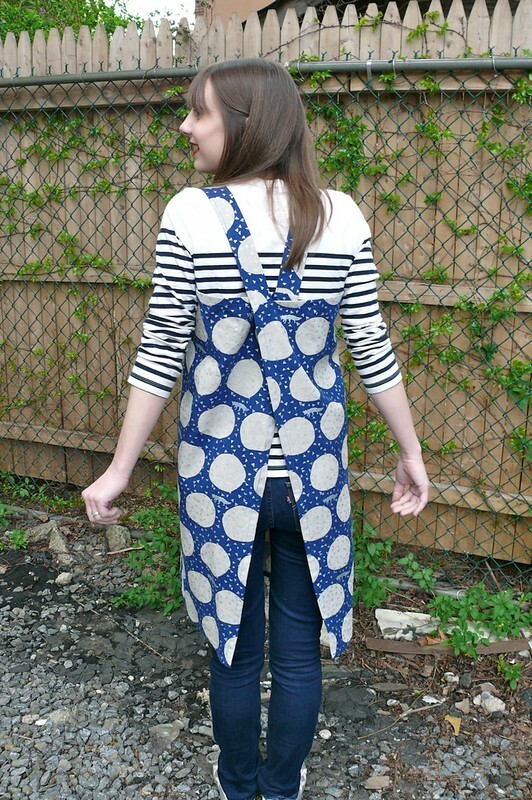 I decided to make a project from the book for this post, and chose to make the cross-back apron. Oddly enough, I actually need an apron for both my jobs (dealing with dusty old furniture and gross decades-old foam at one, wrestling fake fur/fleece/glue at the other) and recently dug through my apartment trying to find my old painting smock without any luck. So I was glad for an excuse to carve out some personal sewing time to whip one up! I was offered fabric from Miss Matatabi for my project, and you’d better believe that I angsted for ages before finally choosing one! Her whole inventory is amazing, and I really struggled to narrow down my choices to just one. 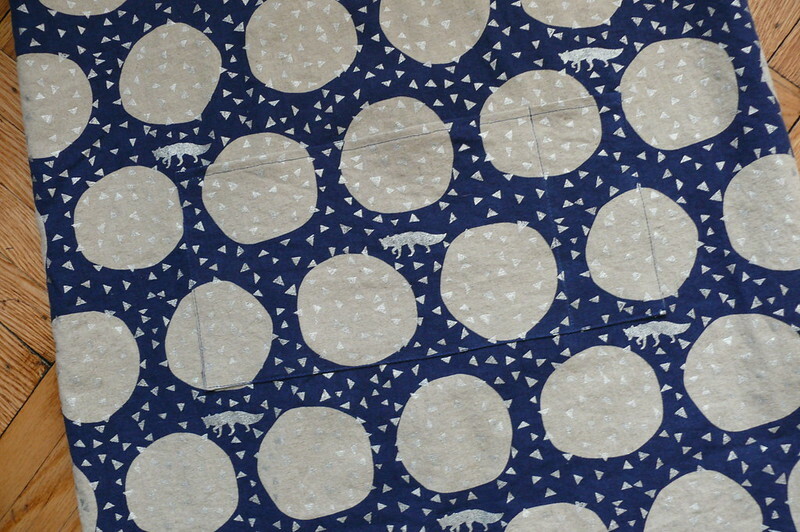 In the end, I picked this Kokka Echino linen/cotton canvas… it’s geometric, it’s got animals, AND it’s metallic? Yep! I’ll take it! (UK readers, I saw it pop up on the M is for Make IG feed the other day… here it is!). The apron is a piece of cake to make, but it’s also really clever- the way the straps are attached make it simple to slip over your head, and it stays in place without any annoying ties, something that I’m cautious about since I work with power tools and dangly bits on your clothes aren’t a great idea. I was suspicious that the apron would shuffle around on my body while I worked, but it’s quite comfortable and I don’t notice it at all while I’m working. There are dimensions given for three adult sizes, as well as four kids’ sizes (with a variation included to make the kids’ straps adjustable… smart!). I used the pocket size suggested for my size, but I split it into two pockets, which works well for holding my frequently-used tools. I took the time to match the pattern across the pocket, which always makes me smile. It’s one of those things that sets a homemade project apart from cheap RTW and I do it whenever I can. Last but not least, I have good news! 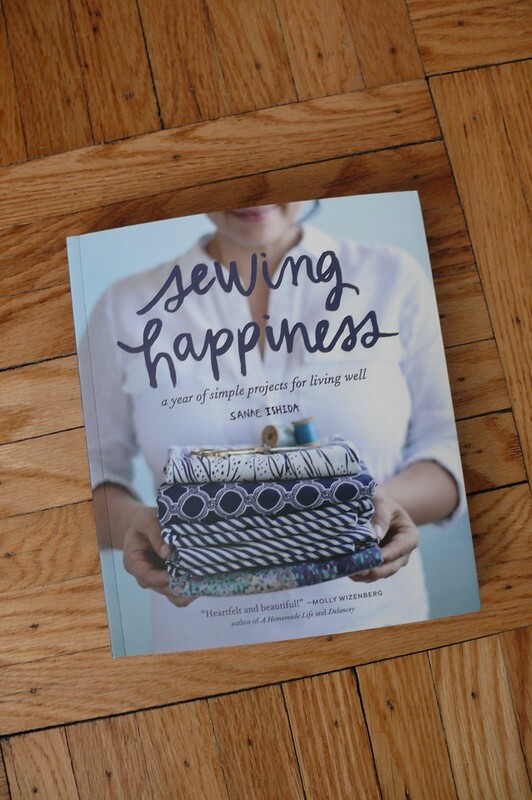 I have a copy of Sewing Happiness to give away to a reader in the US! To enter, please fill out the form here. Also, I have a Miss Matatabi gift card to give to another reader- international readers welcome! For a chance to win a $45 gift card, leave a comment below telling me your favorite fabric from Miss Matatabi (and make sure there’s a way to contact you, either through your commenting profile or in the comment itself). Contests are open until Saturday 4/30/16 at 12P EST. Good luck!! I did not need to know about this etsy shop! Oh dear. I love the Nani Iro Kokka wild elegant waves fabric. Gorgeous! That apron kills me! Soooo good. Miss Matatabi is a dangerous word in my house. 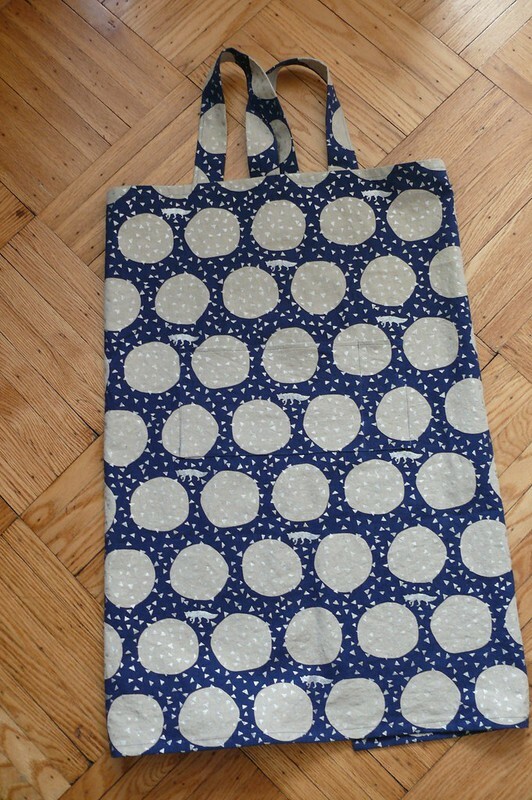 My current fave is Love Apples… it would make such a fab apron! Oh nani iro, no doubt! any fabric from this line is fine with me! Ahh we need more pug spam!!! Beautiful apron ! I can understand why you hesitate to work in it. Yay for pug spam!! 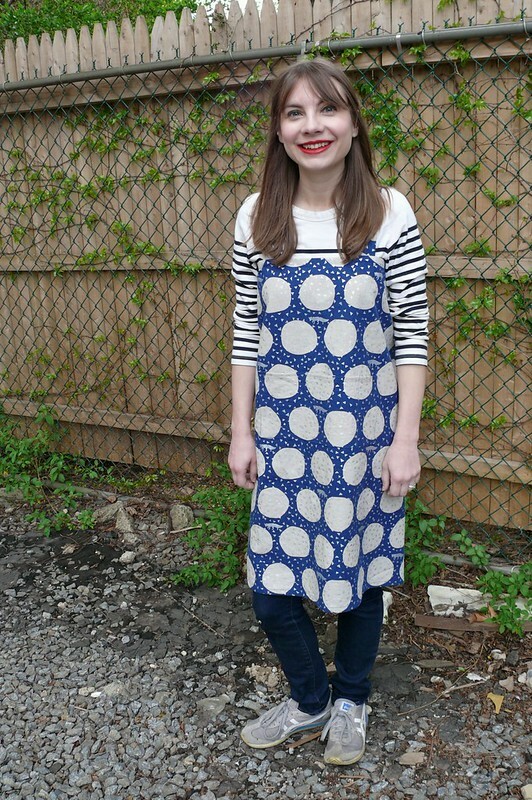 I love this apron, and I feel much like you – how can you wear it as a dress? Lol. I really want this book! Also, I love Miss Matatabi and I love that flamingo voile she has on her site right now. 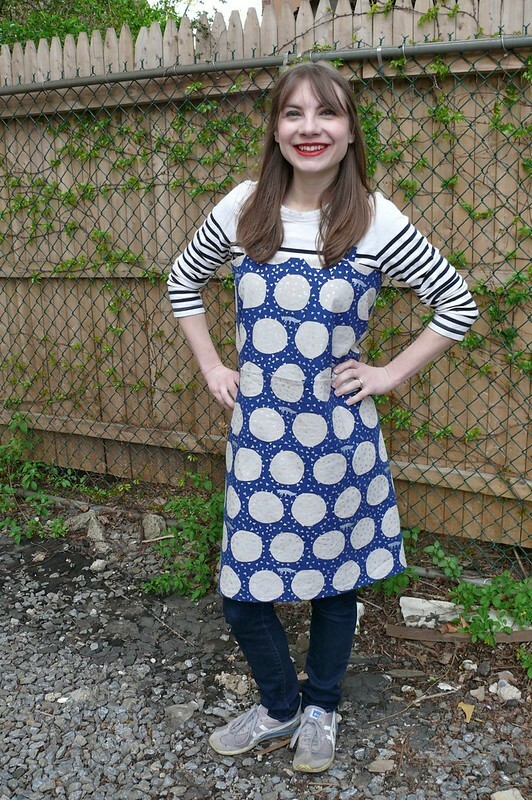 I’m loving the simplicity of this apron – no ties are certainly a good feature. Great fabric choice too. As I’m UK based I’m not elidgable for the book giveaway but luckily I can still enter for the Miss Matatabi giftcard… I had a good look around the Etsy shop and fell hard for Nani Iro Kokka Japanese Fabric Birds Eye – shinsei metallic. Hoping it would be perfect for a summer wedding guest dress. If I win I’ll spend hours debating, but I think it would have to be one of the Nani Iro Kokka fabrics. I especially the floral print ‘calm joy’. I’ve bought lots of vintage patterns lately so I think it would be paired with one of those. I love her shop, everything in it, but my favorite has to be anything Nani Iro, especially the amazingly soft and airy double gauzes. I love that fabric for you! As you say, who could resist all those elements combined? However, given the chance, I’ve been dying to get my hands on some of the double gauze from the Miss Matatabi shop – it’s a bit out of my budget at the moment, but I’ll cross my fingers and hope for the best! I would loooove some beautiful fabric❤️ I would use “Japanese fabric linen voile floral” to make a beautiful blouse. The pineapple fabric at Miss Matutabi is pretty amazing! Also the Tsubaki Camellia. Either would make an amazing button-down shirt. I can see where you would have a hard time making a choice! I think I would like the Japanese Fabric reversible double knit – maybe the birds – pink, grey. I’m ready to make some tshirts! Thank you for the giveaway! Adorable apron! My friend has requested one like this so I nay buy the book. I’d probably pick a Nani Iro double gauze from Miss Matatabi! Cute apron. It’s a nice alternative to the typical style. 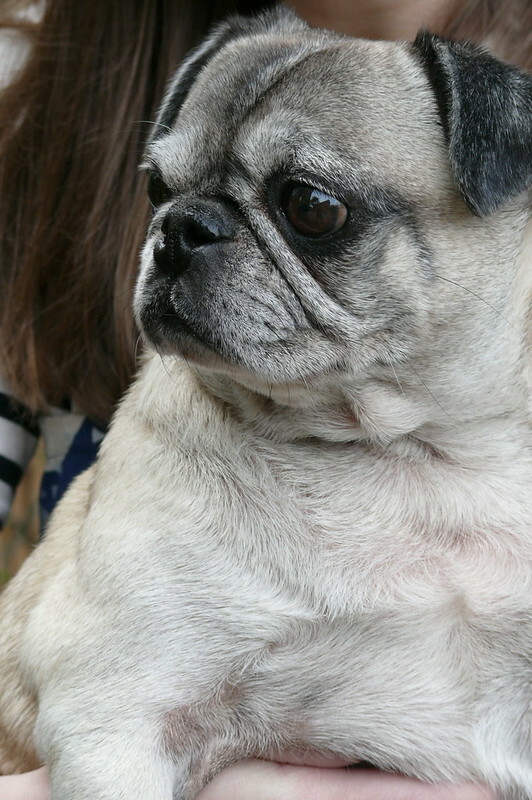 BTW- your little pug is adorable. Nice apron! I lurk her shop ask the time. Some day I hope to take home a double gauze from Nani Ino. So beautiful. Love your new apron – I would also be worried about it getting dirty while you are at work (which would be a real shame). BTW – great work matching up the print on the pocket. I looked through all the fabrics and it was extremely hard to narrow down just one fabric because I loved a lot of the fabrics, however, I would enjoy making a summer top out of the “Tshbaki Camellia” cotton fabric. Oh my, so many gorgeous fabrics! I’m going to say the Nani Iro Kolkata shinsei metallic, but it’s really a toss up between that and at least ten other pieces. That apron design is so clever! Lovely fabrics. I would like to sew something with double gauze. It sounds like in might be great for a humid summer. I really liked the kokka rayon double gauze flora. (soft grey with a little yellow) Your posts are always fun and inspiring. Definitely need me a new apron, too. Love the back of the apron, very cool! Really like the look of the navy wide stripes double gauze. Miss Matatabi stock beautiful prints, I’m always surprised at how quick the shipping is to the UK too! I’ve been stalking Miss Matatabi’s easy shop for 6 months now trying to decide what fabric to buy for curtains in our new apartment. My new favorite is Nani Iro Fuccra: rakuen. We have dark blue/green/grey walls and I think this fabric would go great with them. Thanks for the giveaway! 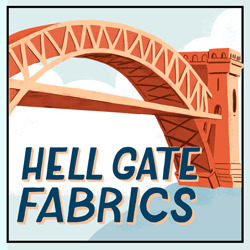 I’ve been stalking Miss Matatabi’s etsy shop for about 6 months looking for the perfect fabric for curtains in our bedroom. My new favorite is Nani Iro Fuccra: Rakuen. I love the birds and the flowers and I think the colors will go well with our grey/blue/green wall. Thanks for the giveaway! I have 3 aprons for just that reason!! And I wear…exactly none of them! Aprons don’t protect me, I protect them. I’ve been thinking about this gingham: https://www.etsy.com/listing/252095744/japanese-fabric-linen-sketched-gingham?ref=shop_home_active_23 but I haven’t quite dared to pull the trigger. Love the pug spam! 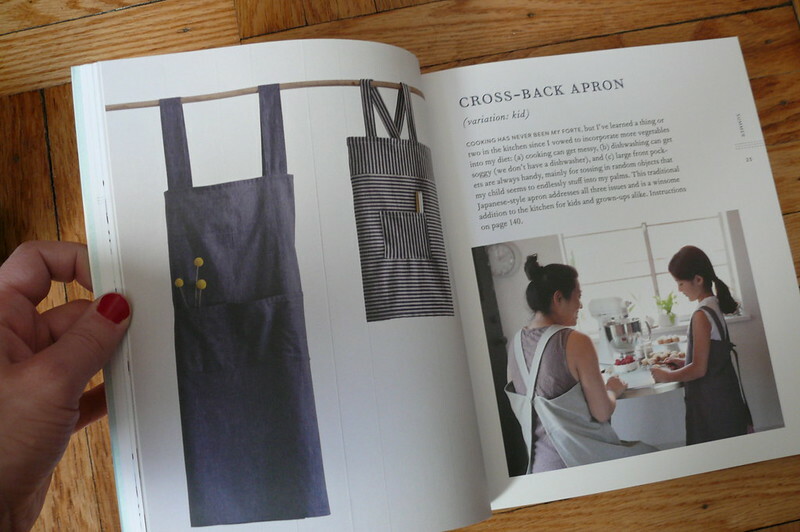 And the book, too, and your gorgeous apron. How ever could you decide which fabric?!!! They are all so beautiful! Your apron is perfect. I wonder if you have trouble with the straps falling down? The design looks like they would stay up, but I thought I’d ask. I’m itching to make some sleeveless button front shirts, and I’ve never used double gauze. I particularly like the lilac double gauze, with a nice floral pattern in purple, my favorite color. Thanks for hosting this! You want me to choose one favorite fabric? One?! How… well I’m very drawn to bright florals, but I find that I don’t actually wear them so my favorite might be the linen black and white plaid. But the little sheep, digital print floral, and rusty red nani iro are so beautiful. I really like Flora and Fauna 2 cotton lawn, but it’s hard to just pick one! you know? Love the silver blue metallic linen! Japanese Fabric double gauze – mimosa flowers – 50cm in Miss Matatabi’s shop and it’s my favorite! Bought the book this weekend at a Mother’s Day booksigning and crafting event. Devoured her story in the mean time. I love that there are no paper patterns to store (but that means drafting a custom fit pattern). I’d argue that several of the projects are easily available online for free, but her personal story was compelling enough for me to buy her book. My first project will most likely be the knit dress.